Check out this sweet volunteer opportunity with the Tampa Bay Sports Commission! Lisa here, calling out to all of my volunteers in the Tampa Bay area. The United Soccer League - SoccerFest & Super Y- League North American Finals are coming to Tampa! (Try and say that three times fast!) They are going to be here from the 17th to the 23rd. That is THIS Wednesday through NEXT Tuesday. They are holding this massive soccer event at two different locations; Ed Radice Sports Complex in Tampa and the Land O&apos;Lakes Recreation Soccer Complex in Land O&apos;Lakes. "United Soccer Leagues is looking for energetic, outgoing individuals to volunteer at the Super Y-League North American Finals and SoccerFest! The Supper Y-League North American Finals is regarded as one of the top youth soccer events in North America. It is a five-day tournament that includes 140 of the best U-13 and U-17 boys and girls soccer teams across the U.S. and Canada." " If you are interested in sport event management, event planning, or soccer in general, this volunteer opportunity is for you. Each year our volunteers gain hands on experience that opens doors to part time internships and full time positions. Opportunities include overseeing game competition, operations, logistics and much more. 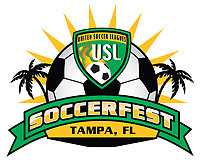 Please visit the website or contact James Edwards at soccerfest@USLSoccer.com for more information." Sounds like a great opportunity to me! That&apos;s all for now Tampa, but check back soon for more Tampa Bay Area Events!